"Black cats remind me of childhood; black cat lollies, the black cat token on Cadbury Black Cat chocolates, and reading "The Black Cat" by torchlight under the blankets," writes Jeniffer on The Lone Baker. 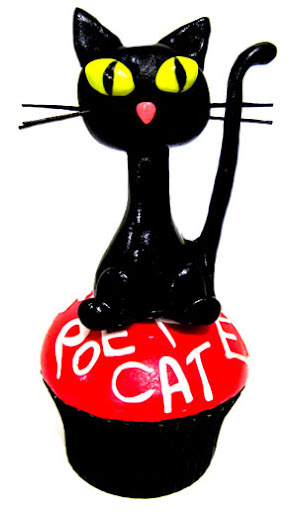 Her mini black cat cupcakes were inspired by Edgar Allan Poe's dark tale of feline retribution, and are a spooky treat just in time for Halloween. Head over to her blog for details on their creation (she used a steamer to make them shiny! ), and follow The Lone Baker on Facebook for even more sweet treats! Those are too cute to eat.